Cristiano Ronaldo Net Worth, Earnings: How Much Does Portugal, Real Madrid Forward Make? Cristiano Ronaldo is arguably one of the most popular football players in the world today, but how much does he make? Ronaldo made his full professional football debut against Moreirense with Portuguese side Sporting CP in 2002, and scored two goals during the game. After impressing in a pre-season game against Manchester United, manager Sir Alex Ferguson signed Ronaldo for £12.24 million (about $20.8 million) in 2003 at the urging of the Man United players. Ronaldo stayed six seasons at Man United, and scored 118 goals in 292 games, before moving to La Liga giants Real Madrid for £80 million (about $136 million) in 2009, making him the most expensive player at that time. In his five seasons at Madrid, Ronaldo has been extremely prolific, scoring 252 goals in 246 appearances. Cristiano Ronaldo’s deadliest in front of goal has naturally translated into a number of club titles and personal awards. Some of these include the English Premier League title, the FA Cup, the UEFA Champions League, the La Liga title, the Copa del Rey, and the prestigious FIFA Ballon d’Or. According to TheRichest.com, Ronaldo has a net worth of $250 million. Forbes puts his earnings at $80 million, of which $52 million come from his salary and winnings, and $28 million from endorsements. 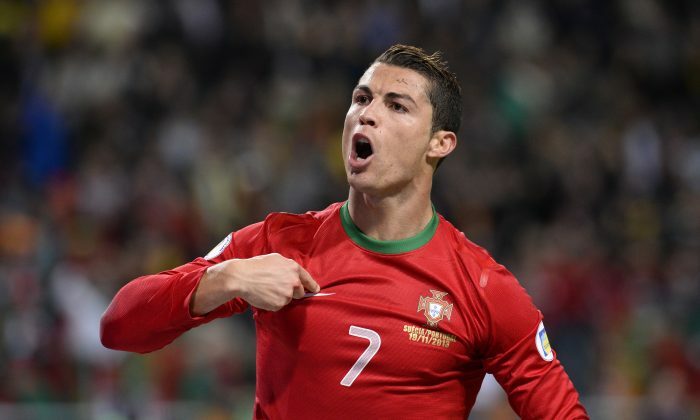 Check out an Associated Press article of Portugal in World Cup 2014 below. LISBON, Portugal (AP) — Portugal fans searching for explanations for their team’s disappointing World Cup performances are finding plenty of possible culprits. A last-gasp 2-2 draw against the United States on Sunday, following a 4-0 thrashing by Germany, has left the Portuguese on the verge of a first-round exit from the tournament in Brazil. Returning home after the group stage would be a stunning upset for team ranked fourth in the world by FIFA. That possibility comes after Spain, Portugal’s Iberian neighbor, saw its World Cup title defense come to an end after just two games. The finger-pointing in Portugal began Monday. Targets for criticism included the team’s perceived over-dependence on star Cristiano Ronaldo, poor physical preparation, misguided organization for the tournament, coach Paulo Bento’s failure to bring new players into the team, and a squad that’s thin on quality midfielders and strikers. Ronaldo gave a candid assessment after the game in Manaus, where Silvestre Varela’s equalizer in added time kept alive Portugal’s slender hopes of advancing. The Real Madrid player recalled Portugal’s troubled qualification for the tournament, which it reached via the playoffs. “We have to be humble and know what we’re capable of,” he said. Ronaldo also indicated he is below his best form. “Recently I haven’t been how I had hoped,” he said. Radio station Renascenca described Portugal’s performance a “fiasco” and demanded a public explanation from the Portuguese Football Federation. Callers to Portuguese radio phone-in programs mostly expressed anger at their team’s showing. Unhappy fans listed their grievances. Bento, the coach since 2010, hasn’t developed or refreshed his team, they said. Against Germany, Portugal showed just once change from the team that faced the Germans at the European Championship two years ago. The squad has little depth. It is thin on quality midfielders and strikers. Eder, a forward with unheralded Portuguese club Braga, has never even played in the Champions League but led the Portuguese attack against the United States. That adds to the pressure on Ronaldo, even though his recent left knee problems apparently have made him reluctant to overly exert himself. A spate of injuries has put fitness staff under the spotlight. Against Germany, three Portuguese players had to be replaced. Against the United States, another two went off. “It’s not normal to have so many injuries,” said striker Helder Postiga, one of the casualties Sunday. Some people have also questioned the wisdom of picking Campinas, near Sao Paulo, for Portugal’s training camp. That allowed the players little time to acclimatize to the jungle humidity of Manaus where they faced the Americans.